Solo dress worn only six timeslike new. Cerise pink, black and white. This one piece dress has a cerise pink micro velvet bodice with sparkly white with hotpink overlaid sleeves and neckline. The skirt is a structured three tiered ” rah rah” style with black and white pleats and ruffles with black embroidery. 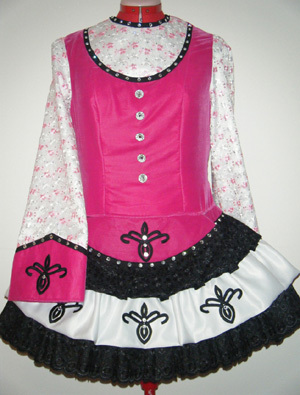 The under skirt is light pink and has matching bloomers. There are many Swarovski crystals to give it that extra sparkle.